AUSTIN, Texas - Nov. 30, 2016 - Cirrus Logic (NASDAQ: CRUS) is delivering the same high fidelity audio quality and many of the same advanced audio features found in its premium audio and voice ICs to smartphones beyond flagship models. 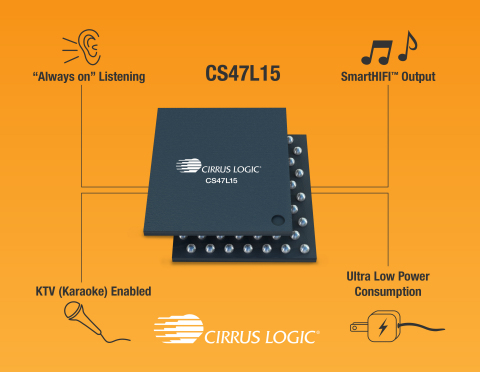 The CS47L15 low-power smart codec is the newest member of Cirrus Logic’s SmartHIFI™ audio and voice IC portfolio and enables smartphone OEMs to cost-effectively incorporate advanced audio features, such as “always on” voice activation, enhanced karaoke and virtual stereo and protection algorithms for enhanced speaker playback. These extensive audio features, which have previously been limited to flagship smartphones and tablets, empower consumers with greater voice control over their mobile device while delivering a superior, noise-free audio playback experience. The CS47L15 provides a premium listening experience featuring Cirrus Logic SmartHIFI, a unique combination of powerful DSP processing, ultra-low power consumption and high-quality audio playback typically associated with high-end audio equipment. Its ultra-low power performance (25 microwatts standby operation, 2.6 milliwatts headphone playback) ensures significant battery life savings. The small component size, low power dissipation, hi-fi quality audio and world-class stereo separation (-110 dB crosstalk) of the CS47L15 make this an ideal choice for the growing number of digital headsets. The CS47L15’s integrated equalizer and programmable DSP enable optimized digital audio quality, allowing OEMs to create their own “signature sound” and deliver an enhanced user experience compared to analog headsets. The CS47L15 elevates the hi-fi audio experience, offering clear, transparent and natural audio playback, with a flat frequency response across the full HD audio bandwidth. Its low output impedance ensures consistent audio performance regardless of the headphone connected. A low-latency monitoring path allows for enhanced KTV (karaoke), a hugely popular app in Asia, through such features as realistic room reverberation and ambient effects to further enhance the user experience. In addition, previously high-end audio features, such as noise reduction and echo cancelation, combine to significantly enhance audio and voice conversation quality. The CS47L15 is supported on multiple application processor platforms, enabling a consistent feature set and high-performance capability across a wide variety of handsets from leading OEMs. A variety of interfaces allows for integration with all of the key components in the complex architectures of the latest mobile devices, including baseband and applications processors, wireless audio transceivers, analog or digital MEMS microphones and boosted speaker amplifiers. The device supports popular third-party voice-wake trigger engines, including Google Hotword and Sensory TrulyHandsfree™. In addition, development tools are available for customers and third-party IP providers to develop custom solutions on the programmable Cirrus Logic DSP core. Cirrus Logic, Cirrus, the Cirrus Logic logo design and SoundClear are registered trademarks or trademarks of Cirrus Logic, Inc.